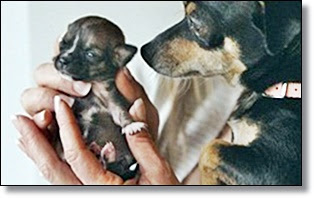 Meet Beyoncé: The "World's Tiniest Dog"
The world's smallest puppy named after one of the world's biggest pop stars, Beyoncé, was so tiny at birth she could fit on a spoon. The female Dachshund mix dog weighed just one ounce when she was born. 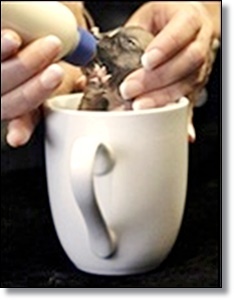 Animal rescuers in California say that she still remains so small that she can easily fit on an iPhone while she is the same size as a business card or credit card. Experts say she is now likely to set a new record for being the world's tiniest dog. She is not yet officially the title holder but a "fast-track" application has been submitted to the Guinness World Records. 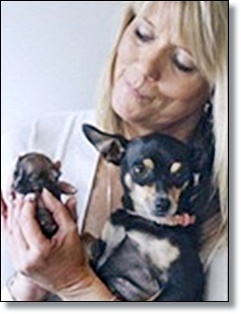 But a dog rescue centre in El Dorado Hills, California, has now been inundated with requests to adopt the little animal. Beyoncé was the runt of a litter of five that was born to an abandoned dachshund mix, named Casey. Their mother was too heavily pregnant to have a termination and was scheduled to be put down. But vets intervened and looked after the dog until she gave birth a fortnight ago. When Beyoncé was delivered, vets were convinced she was still born. She was the last one delivered and was born without a heartbeat. Dr Michael Russell, the Grace Foundation's vet, then attempted to give her heart compressions but she still wasn't breathing. Mouth-to-mouth resuscitation was then given by assistant Beth DeCaprio. She said: "It was actually a little funny, and gross, trying to get my mouth around hers, but after a couple of really small breaths she took a deep breath and started to really move around. "We cleaned out her little nasal passages, and I gave her a couple more breaths and then she started breathing on her own. She is just a remarkable little survivor. "Our hope is that Beyoncé and her miraculous story of survival helps spread awareness about the plight of rescue dogs." Beyoncé is still smaller than the rest of her siblings but she's grown to 124g and is said to be thriving. She is expected to weigh less than 1kg when fully grown. Horses with Rickets - What is Rickets? Lyme Disease in Dogs- What You Need to Know! Can Wild Birds Be Tamed and Kept As Pets? What States Don’t Allow Ferrets? Did You Know that Mulch is Highly Toxic to Pets? What Gives Huskies Their Piercing Blue Eye Color?